The mother of the bride wore white and gold. Or was it blue and black? 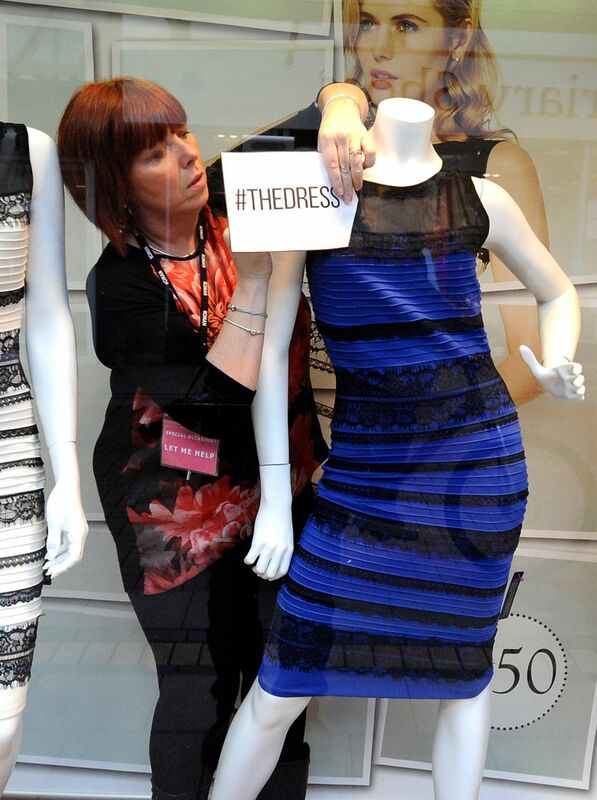 One photograph of the dress posted online led to broad disagreement — and an Internet sensation. Friends and co-workers worldwide are debating the true hues of a royal-blue dress with black lace that, to many an eye, transforms in one photograph into gold and white. Experts are calling the photo a one-in-a-million shot that perfectly captures how people’s brains perceive color and process contrast in dramatically different ways. The photo, taken this month before a wedding on the remote Scottish island of Colonsay, also illustrates the dynamics of a perfect social-media storm. 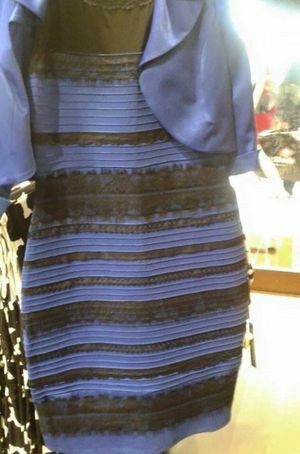 Guests at the wedding could not understand why, in one photo of the dress being worn by the mother of the bride, the clearly blue and black-striped garment transformed into gold and white. But only in that single photo, and only for around half the viewers. One such wedding guest, musician and singer Caitlin McNeill, posted the photo Thursday night to her Tumblr account with the question: “Guys please help me. Is this dress white and gold, or blue and black? Me and my friends can’t agree and we are freaking the (expletive) out.” She’s consistently seen white and gold. One of her friends, Alana MacInnes, saw gold and white for the first hour but then black and blue. BuzzFeed sensed clickbait heaven and, amid its own newsroom argument, was among the first to call McNeill. As the debate caught fire across the Internet — even scientists could not agree on what was causing the discrepancy — other media companies rushed to get stories online. At its peak, more than 670,000 people were simultaneously viewing BuzzFeed’s post. The entertainment elite also chimed in. Taylor Swift saw the dress as “obviously” blue and black. “What’s the matter with u guys, it’s white and gold,” countered Julianne Moore. Kim Kardashian West, never one to miss a trending topic, reported she was seeing gold but to husband Kanye West, it was solidly black and blue. “Who is color blind?” Mrs. West asked the twitterati. Politicians also were eager to stake out their positions. Sorry, senator. The dress was blue and black. It sells for 50 pounds at Roman Originals, a British retailer. Hardiman-McCartney says the exceptional bar-code style of the dress, combined with the strongly yellow-toned backlighting in the one photo, provides the brain a rare chance to “choose” which of the two primary colors should be seen in detail. Duje Tadin, associate professor for brain and cognitive sciences at the University of Rochester in New York, theorized that the different perceptions may be due to variations in the number of photoreceptors called cones in the retina that perceive blue. The human eye has about 6 million cones that are sensitive to green, red or blue. Signals from the cones go to the brain, which interprets them as color. There’s one clear winner: Roman Originals, which reported a million hits on its sales site in the first 18 hours after the photo’s worldwide distribution. She said staff members had no idea the dress, when shot in that singularly peculiar light, might be perceived in a totally different color scheme. Not until Friday anyway, when they arrived at work to field hundreds of emails, calls and social-media posts. They, too, split almost 50-50 on the photo’s true colors. The bride is on her honeymoon in Jamaica. As of Friday morning, McNeill had not spoken with her since her post blew up.